Nina Ricci Nina Edition Princess D'un Jour is a luxury perfume, filled with optimism & positive. Nina Ricci Nina Edition Princess D'un Jour 80ml. Eau De Toilette - Popular French perfume house of Nina Ricci fragrance released Nina Princess d'un Jour in 2012. It belongs to a group of floral fruity flavors. Nina Princess d'un Jour by Nina Ricci - a luxury perfume, filled with optimism and positive. It reveals the smell of youth and coquetry. The sweet scent of the magic lies in the original bottle in the form of an apple covered with red sequins. Charming perfume composition of the sweet fragrance starts with top notes of lime and lemon Calabria continues notes heart praline, apple, peony, fleur-de-lune, petals peony and vanilla, as well as passes to the base consisting of notes of white cedar, wood apple and cotton musk. 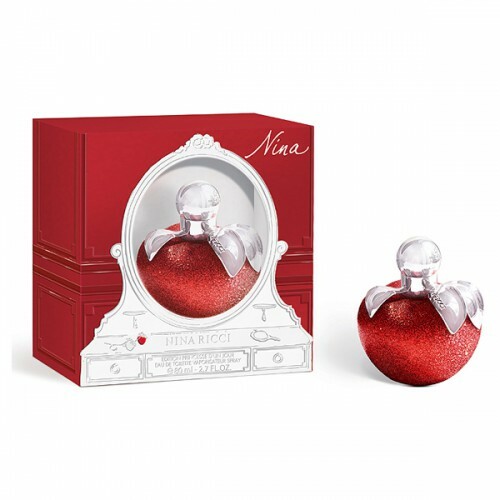 Nina Ricci plunges us into a magical world of fairy tales of the ultra glamorous princess and her new perfume Nina Ricci Nina Princess d'un Jour. After all, every girl, every woman become a princess, at least for one day! And new fragrance Nina Ricci Nina Princess d'un Jour fulfills this desire! Slakdy aroma of apple and praline richly decorated with an unusual note of cotton. Toilet water Nina Ricci Nina Princess d'un Jour covers the line and Nina Ricci Nina is the latest version of the romantic perfume. Collection bottle of Nina Ricci Nina Princess d'un Jour completely covered with red sequins. Top notes: lemon Calabria Lime. Heart notes of apple, praline, vanilla, peony petals, fleur-de-Lune. Base notes of apple wood, white cedar, cotton and musk. A luxury perfume, filled with optimism and positive. It reveals the smell of youth and coquetry. The sweet scent of the magic lies in the original bottle in the form of an apple covered with red sequins.